Yes, Harrison Ford is 65 years old. There’s a gauntness to his cheeks these days, and a steely grey to both the hair on his head and the stubble on his chin. But when he first appears on screen in Indiana Jones and the Kingdom of the Crystal Skull as the iconic archaeologist/adventurer—a shadowy silhouette donning his iconic fedora—it’s easy to imagine him 20 years younger. More to the point, it’s easy to imagine yourself 20 years younger. Such is the history that informs this first Indiana Jones film since 1989’s Indiana Jones and the Last Crusade, that of a generation of moviegoers for whom Raiders of the Lost Ark—that rollicking throwback brainchild of George Lucas and Steven Spielberg—was nearly as significant a touchstone as Star Wars. John Williams’ rousing fanfare, the bullwhip and, yes, the fedora—these are the things that quicken the pulse. 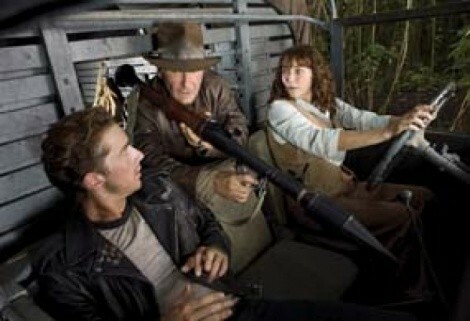 Their familiarity is Kingdom of the Crystal Skull’s blessing. And they are also its curse. There’s little point speculating what kind of response Kingdom of the Crystal Skull might have inspired were it not carrying the expectations of a beloved franchise. It’s a contraption built almost entirely out of its own legacy, even more pointedly self-referential than Last Crusade. In the opening set piece that finds Indy in 1957 kidnapped by Russians seeking a mysterious artifact in a Nevada military base, a broken crate reveals the familiar profile of the Ark of the Covenant. Photos on Indy’s office desk nod to the passing of Marcus Brody (Denholm Elliott) and Dr. Henry Jones Sr. (Sean Connery); Indy’s infamous fear of snakes pops up as our protagonists journey to South America. Even Marion Ravenwood (Karen Allen) reappears to rekindle some love-hate banter. The plot details that have become a spoiler-rific Internet cottage industry hardly seem to be the point. Spielberg and Lucas know why we’re here and have no problem reminding us at regular intervals. As much as they seem to understand the formula they’re being asked to replicate, however, they don’t seem to take much joy in it. Action sequences clip along at a familiar pace—their preposterousness pushed to the edge of a cliff both figuratively and literally—and we get the requisite sequence involving massive quantities of some kind of creepy-crawly critter. But while the fight choreography occasionally rises to the occasion, Kingdom of the Crystal Skull too rarely pops with genuine energy. So much feels forced: the squabbling between Indy and Mutt (Shia LaBeouf), the young man who solicits his aid to find Indy’s old colleague Professor Oxley (John Hurt) and a valuable crystal skull; a South American graveyard encounter with shadowy natives apparently trained in parkour; the attempt to turn Soviet paranormal expert Irinia Spalko (Cate Blanchett, apparently sharing Javier Bardem’s No Country for Old Men barber) into a badass villain. Screenwriter David Koepp has built something out of the franchise’s recognizable pieces, but the pieces sometimes don’t fit together. It would be easy to make Ford’s age the scapegoat—suspecting that Lucas and Spielberg only built as much swashbuckling into the story as their star could handle—but that’s not the problem here. In fact, Ford’s performance is one of the film’s most satisfying elements, a twinkly return to the kind of roguish characters he played before he became a clench-jawed robot. He and Allen—who has changed so little in 27 years that she must have a disintegrating portrait of herself in an attic somewhere—bring the story to life when it needs it most, and carry the nostalgia past the perfunctory toward something that actually resonates. True, it’s a bit ridiculous watching him still play the academic skeptic regarding supernatural forces—c’mon, dude has seen the Hand of God in action twice—but that has nothing to do with whether he can still take a punch with aplomb. No, it’s not Harrison Ford who feels creaky in Kingdom of the Crystal Skull; it’s everything that has been constructed around him. Every one of the four Indy films involved over-the-top elements, but at their best, they earned latitude thanks to their light-footedness: the pinpoint editing of Raiders; the father-son dynamic in Last Crusade. This time, the creative team spends so much time telling us how wonderful it is that we’re all here together again that they forget to make us interested in what’s actually happening. The star may seem revitalized, but those of us who were hoping to feel the same are left feeling … whipped.